It went down to the final race of the day as Southwest DeKalb held off Stephenson 118-114 to repeat as the Region 6-5A track champions at Lakewood Stadium in Atlanta on Thursday. The two DeKalb teams went into the final event tied and whichever team finished ahead of the other in the 4×400 meter relay would take the title. The Panther team of Marcellus Boykins, Terry Conwell, Jaylan Muhammad and Justin Tomlin ran a blistering 3:13.92 to take the gold and Stephenson finished in third in 3:23.44 as Southwest DeKalb got the points needed to seal the championship trophy. 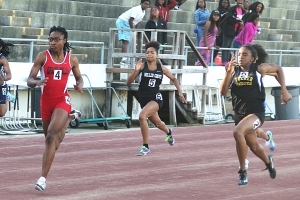 Southwest DeKalb was in third and Stephenson was in fourth after the field events trailing Mays by 22 and 23 points, respectively. Two gold medal performances by Southwest DeKalb’s Tariq Bradford in the high jump (6-02.00) and the triple jump (46-08.00) had the Panthers within striking distance with the strength of team coming up in the field events. Stephenson was in fourth behind a gold medal in the long jump by Denzel Harper (23-11.50) which would be the first of three in the championships for the Jaguar leader. 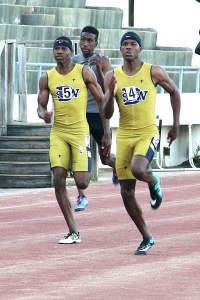 Southwest DeKalb opened the track events by taking the 4×100 relay in a time of 41.49 by the team of Boykins, Terryon Conwell, Muhammad and Tomlin. Terry Conwell then added a gold medal in the 400 meter dash (46.78) with Tomlin in second (48.86) as the Panthers tried to pull away from the pack. One-two sweeps of the 100 and 200 meter dashes continued to aid the Panthers cause. Terryon Conwell won the 100 in 10.68 and Muhammad was second in 11.09. Terry Conwell picked up his second individual gold with a win in the 200 meter dash (21.30) with his twin brother Terryon right on his heels in second with a time of 21.33. 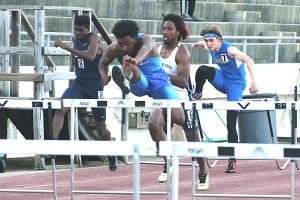 Harper was not going to let the Panthers run away with the title and teamed up with Joshua Browning in the 110 meter hurdles and the 300 meter hurdles for a pair of 1-2 sweeps for the Jaguars. Harper won both events taking the 110 in 14.92 and the 300 in 38.81. Browning was second in both running a 15.49 in the 110 and a 40.12 in the 300. Brandon Hines also won the 1600 meter run for the Jaguars in 4:28.78. Druid Hills fourth place finish was keyed by silver medal finishes in the shot put (49-05.75) and discus (121-10.00) by Javier Lee and in the 3200 meter run by Ermias Twolde (9:59.46). Suheib Mohamed won the 3200 meter run (9:53.55) and took the bronze in the 1600 (4:35.67) to lead Clarkston to a fifth place finish. Dunwoody rode a one-two finish in the pole vault by Sam Haas (11-06.00) and Phineas Haq (10-00.00) to finish sixth in the team standings. The Dunwoody Lady Wildcats (93.50) and Stephenson Lady Jaguars (91) had a tight race for second and third behind champion Mays (130). One-two finishes in the 3200 meter run by Ansley Heavern (12:19.88) and Samantha Cameron (12:32.37) and in the pole vault by Rachel Sinclair (9-07.00) and Alexandra Womble (8-00.00) keyed the Lady Wildcats runners-up finish. Madison Beecher contributed a pair of silver medal finishes to the Dunwoody cause in the 200 meter (25.34) and 400 meter (56.98) dashes. Timberly Molden’s sweep of the shot put (39-11.00) and discus (124-03.50) to lead the way for the Lady Jaguars. A gold medal by Simone Harper in the long jump (18-01.00) and a silver medal finish by the 4×100 meter relay team (47.94) also played a role in Stephenson’s third place finish. Druid Hills’ Keeghan Peppers rolled to a gold medal victory in the 100 meter dash with a time of 12.22 to round out the DeKalb winners.